U.S. auto safety officials have been investigating 23 Fiat Chrysler recalls dating back to 2009. Editor's note: Some earlier versions of this story misidentified the vehicles that FCA agreed to buy back. Most of them are Ram pickups. WASHINGTON -- Fiat Chrysler Automobiles agreed to pay a $70 million fine, accept three years of additional oversight by an independent monitor and buy back thousands of vehicles as part of a consent agreement to settle a U.S. government probe into 23 recalls since 2009. The $70 million cash fine is part of a potential $105 million civil penalty, the largest ever imposed by the National Highway Traffic Safety Administration, and part of a sweeping settlement to spur an overhaul of the automaker's safety and recall practices, the U.S. Department of Transportation announced Sunday evening. Fiat Chrysler must spend another $20 million to meet performance requirements laid out by the consent agreement. The automaker may have to pay another $15 million if the monitor discovers additional violations of U.S. auto safety laws, or if Fiat Chrysler violates terms set by the consent order, the department said. Fiat Chrysler, as part of the consent agreement, admitted that it “failed to timely provide an effective remedy” in three recall campaigns, and that it failed to comply with “various reporting requirements” of U.S. laws governing recalls in a timely manner. In a separate statement, the company said it accepted "the resulting consequences with renewed resolve to improve our handling of recalls and re-establish the trust our customers place in us." The company said it was also "intent on rebuilding our relationship with NHTSA" and embracing the role of a public safety advocate. NHTSA and other government officials appeared pleased with the broad agreement and the message it will send to other automakers. The consent agreement was signed on Friday. News reports of the deal began to appear late Saturday. The deal resolves the government's inquiry into 23 Fiat Chrysler recalls that were the subject of a rare public hearing on July 2. The independent monitor could identity additional issues that require attention, according to a NHTSA official. That monitor, to be approved by NHTSA, will “assess, track and report the company's recall performance” for the next three years, part of “unprecedented” additional oversight by the agency agreed to by Fiat Chrysler, the Transportation Department said. As part of the deal, Fiat Chrysler said it has agreed to buy back about 200,000 vehicles from a recall population of about 500,000 vehicles, most of them Ram pickups, with defective suspension parts that could cause drivers to lose control. The cost of the buybacks would be included in the $20 million worth of performance requirements, FCA said in a statement Monday. "While such amounts may exceed the $20 million, contrary to certain reports, FCA US does not expect that the net cost of providing these additional alternatives will be material to its financial position, liquidity or results of operations," the company said in the latest statement. Owners of more than 1 million Jeep Liberty and Grand Cherokee SUVs with rear-mounted fuel tanks linked to several deadly fires can either trade-in their vehicles for above-market value, or opt to take a “financial incentive” to have a trailer hitch installed, the department said. Reason for recall (13V-038): To correct a defect that may cause the axle to lock. As a result, the driver may lose steering power and crash. Reason for recall (13V-527): To fix a defect that may cause the driver to lose steering power and crash. Reason for recall (13V-529): To repair and replace steering linkages that may cause the driver to lose steering power and crash. Note: The total number of vehicles to be bought back will be less than 200,000 units after 60 percent of the recalled vehicles have been repaired, FCA said in a statement. Fiat Chrysler becomes the third automaker after Honda Motor Co. and General Motors to fall under additional oversight by NHTSA since 2014 because of recall lapses. FCA has been in talks with NHTSA over the penalties for several weeks after the agency's July 2 hearing into the company's recall and safety practices. At the hearing, NHTSA cited evidence that Fiat Chrysler had taken too long to launch recalls, delayed producing parts needed to repair defects, and didn't do enough to ensure that consumers were notified and complied in a timely manner. Rosekind, the head of NHTSA, said then that Fiat Chrysler had exhibited a pattern of not meeting its legal obligations covering recalls. At the hearing, Scott Kunselman, senior vice president of vehicle safety and regulatory affairs for Fiat Chrysler, acknowledged the company has fallen short while handling recalls and said NHTSA officials had "legitimate" concerns about the automaker's practices. On Friday, NHTSA said it would launch a new investigation into Fiat Chrysler's handling of a recall of about 1.4 million vehicles for possible cybersecurity flaws following a report that hackers took remote control of a moving Jeep. In 2013, some 1.5 million older Jeep Liberty and Grand Cherokee SUVs were recalled to install trailer hitches if they didn't already have one to protect the fuel tank in a rear-end collision and lessen the risk of a fire following such a crash. 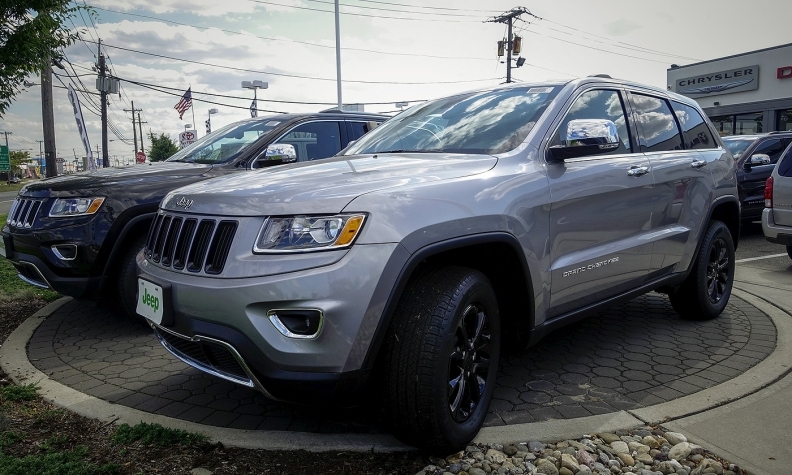 The plan was a compromise brokered by FCA CEO Sergio Marchionne and NHTSA's then-administrator David Strickland, who initially wanted the automaker to recall 2.7 million Jeeps for the problem. But the first run of replacement trailer hitches weren't manufactured until nearly a year later, in May 2014, prompting renewed scrutiny from the agency. As of April 30, FCA had installed trailer hitches on about 320,000 of the 1.5 million recalled Jeeps. The pace of fixes has been slow and sporadic, frustrating government officials. NHTSA, amid a record string of recalls and high-profile safety lapses throughout the industry, has also come under fire from U.S. lawmakers and consumer advocates for failing to adequately monitor automakers and their suppliers. Under Rosekind, who took over as administrator in December, the agency has moved to crack down on automakers and taken a harder stance on longtime industry safety practices. Foxx and NHTSA officials have also called for higher fines, now capped by Congress at $35 million per offense. The agency, after a blistering report from the Transportation Department's inspector general, is overhauling its operations, notably defect analysis, while ratcheting up probes of automakers. It has also pressed for more cooperation from automakers. “We need a proactive safety culture in this country,” Rosekind told reporters last week at a briefing in Detroit. Honda was slapped with a $70 million fine in January -- the biggest levy at the time -- for failing to disclose more than 1,700 reports of deaths, injuries and other "early warning" information to federal safety officials over more than a decade. Last year, General Motors was fined $35 million for failing to notify regulators in a timely manner of faulty ignition switches on older models that have been linked to more than 120 deaths. NHTSA recently decided to extend its oversight of GM's safety and recall practices. David Phillips contributed to this report.